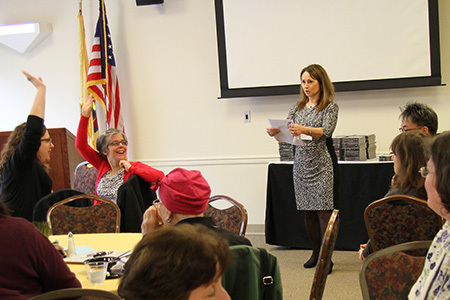 West Windsor, N.J. – More than 50 science educators from New Jersey community colleges and several four-year institutions attended a full-day session spearheaded and hosted by Mercer County Community College (MCCC) at the MCCC Conference Center April 10. The workshop was funded by the Howard Hughes Medical Institute (HHMI), one of the most prestigious agencies that supports biological science education and research, and organized by MCCC Biology Professors Laura Blinderman and Diane Hilker. The focus of the day was “Evolutionary Biology and Cancer Genetics.” Attendees engaged in a variety of interactive activities for use in their undergraduate biology courses. The morning workshop was on cancer genetics, which was followed by the film Lizards in an Evolutionary Tree and a discussion of the use of morphological and molecular data in phylogenetic tree-building. The afternoon session focused on evolutionary genetics in the three-spined stickleback fish. According to Professor Hilker, the conference was a first for community colleges in New Jersey. “We are so pleased to partner with HHMI,” she said. “This was a day for us to learn new approaches and to learn from each other.” She added that she hoped it would be the first of many such workshops. Representatives from 12 community colleges and 4 four-year institutions attended. Dr. Eun-Woo Chang, MCCC’s Vice President for Academic Affairs, brought the program to Mercer after reaching out to HHMI about presenting science seminars designed for community colleges, just as they do for high school teachers and four-year college and university professors. Dr. Chang envisions the conference as a stepping stone for a future statewide conference on the STEM (Science, Technology, Engineering and Mathematics) disciplines. 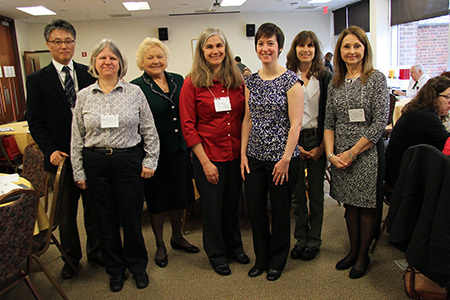 HHMI's presenters, front row, from left, Drs. Kathy Jones, Elizabeth Rice and Megan Stine, with MCCC staffers, back row, from left, Vice President for Academic Affairs Eun-Woo Chang, President Patricia C. Donohue, and Biology Professors Laura Blinderman and Diane Hilker. Diane Hilker welcomed representatives from each of the colleges. She and Professor Laura Blinderman organized the workshop. The HHMI presenters included Drs. Elizabeth Rice, Megan Stine and Kathy Jones. In addition to hands-on activities, the three came ready to share free materials for the classroom from HHMI’s Biointeractive website, including short films, virtual labs, apps and print materials that combine conceptually challenging science lessons with engaging activities. The materials are provided to educators through an HHMI-supported endowment.